Universal Studios Japan, Sanrio Puroland and Tokyo Disney Resort are packed full of Christmas events for this year’s holiday season. Let’s take a look at what’s going on at each park right now. 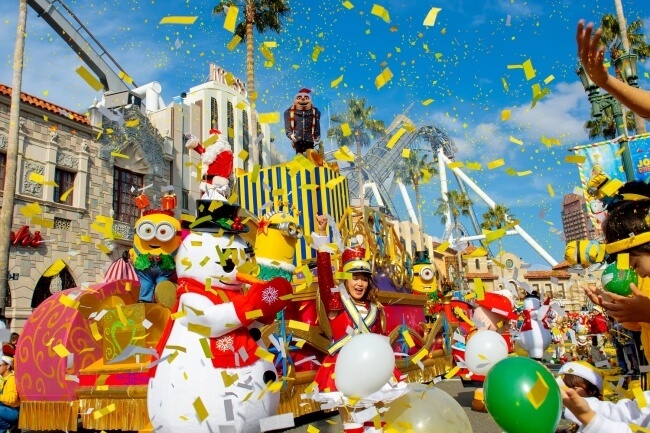 Universal Studios Japan has added a new daytime program titled Yellow Christmas to its “Universal Wonder Christmas” winter event which is running until January 6, 2019. The main event of Yellow Christmas is seeing the cheeky Minions from the Despicable Me film franchise come together for the Minion Hacha Mecha Christmas Party. This party is bigger, better and crazier than last year’s hugely successful run. 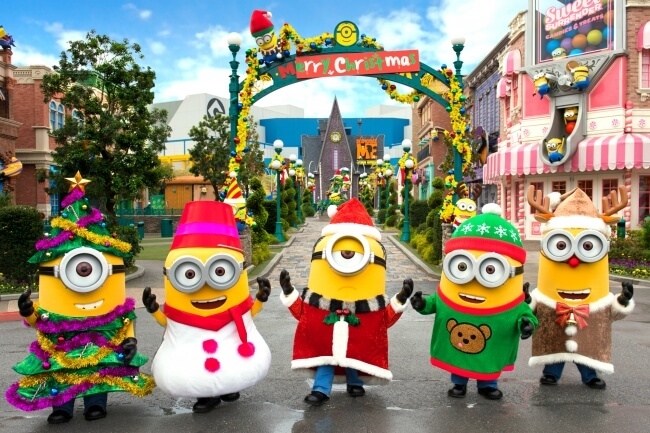 Expect to see Minions donning Christmas attire as well as appearances from Gru and Santa Claus. Yellow balloons float across the event and bubbles are blown as everyone comes together for festive merry making. The event finale sees Minion-yellow confetti shoot across the whole area. The decorations give rise to a completely new kind of Christmas aesthetic from the usual red and green combination. Embrace your inner Minion! 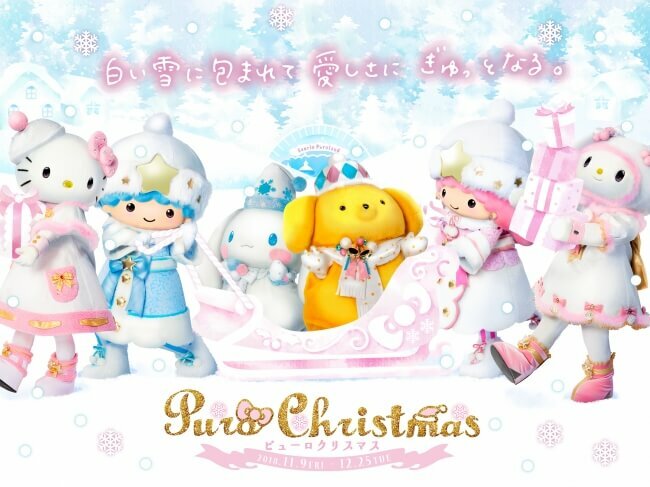 Sanrio Puroland’s white Christmas-themed event “Puro Christmas” is currently being held up until Christmas Day. “The Puro Christmas” is a brand new musical that has arrived at the park to warm the hearts of its guests this Christmas. It will is centred around Hello Kitty and the Little Twin Stars (Kiki and Lala) who are joined by some other familiar Sanrio faces. The show contains lots of Christmas songs, and guests are pulled into a winter wonderland as gorgeous flurries of snow fall before them. 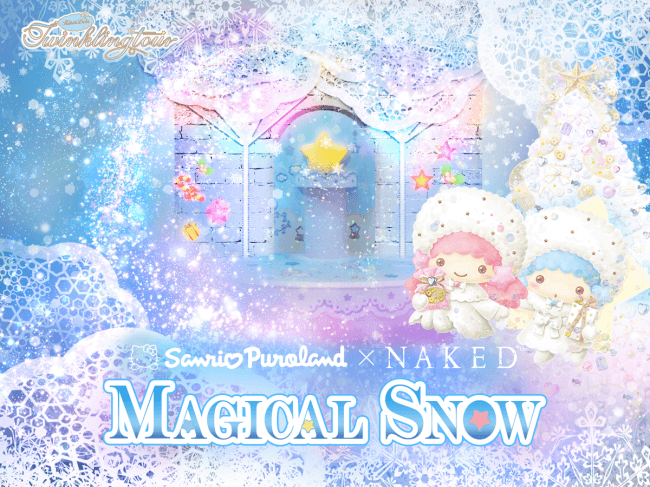 Magical Snow is a new attraction at the park made in collaboration with NAKED that is running for a limited time only. 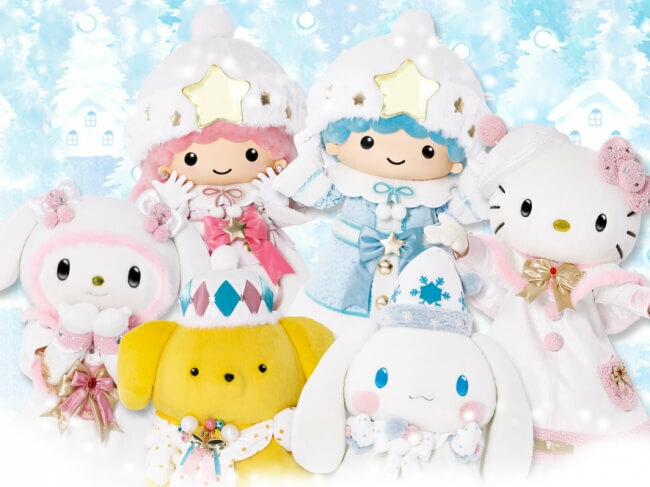 It takes place at Kiki & Lala Twinkling Tour, an attraction based on the Yume Star-Cloud where Kiki and Lala were born. The attraction has been turned into a snowy world for this Christmas only. 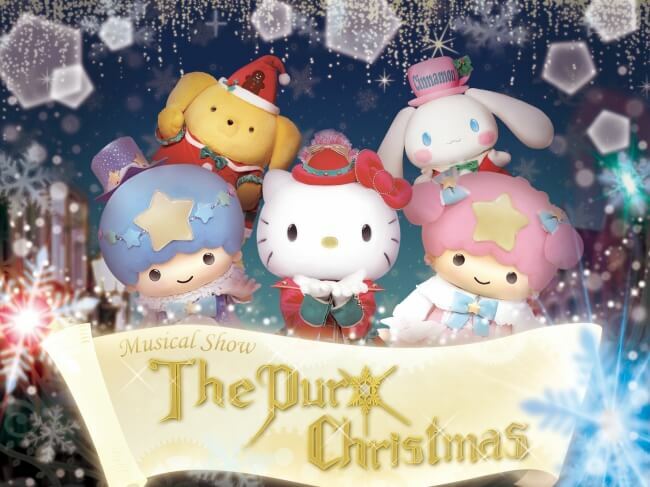 Enjoy Christmas as you never have before this year at Sanrio Puroland. Tokyo Disneyland and Tokyo DisneySea are now hosting a special Christmas event this year which is running up to December 25. Tokyo Disneyland is celebrating its 35th anniversary this Christmas. At Celebration Street, which is open at the park’s World Bazaar to commemorate 35 years, it is holding a very special performance you can only see during this holiday period. Christmas music, visuals and lights carry the Christmas spirit through the bazaar centred around Celebration Tower which is decorated in all the colours of Christmas. And for the first time ever, this year sees a Christmas tree behind Cinderalla’s castle with the 35th anniversary logo on it. 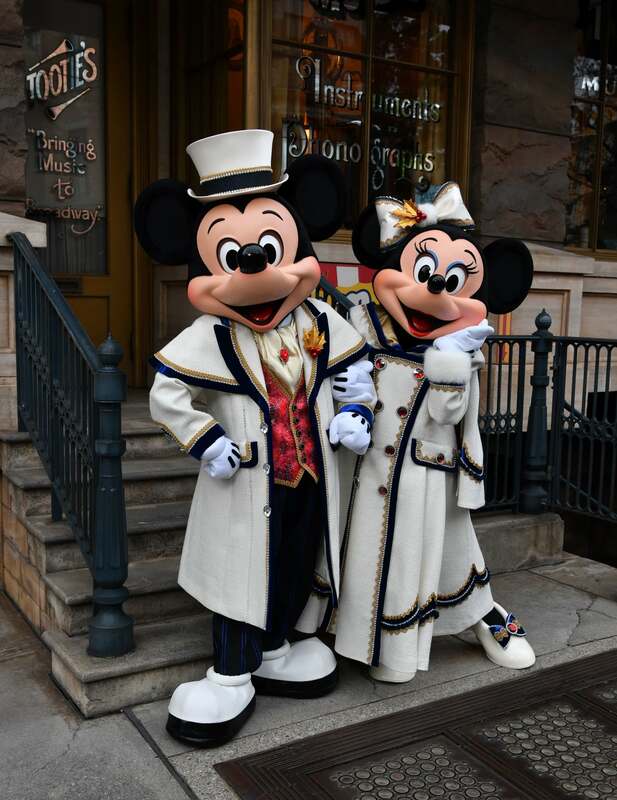 Over at Tokyo DisneySea they are hosting a range of festive events. This includes the new daytime harbor show “It’s Christmas Time” at the Mediterranean Harbor which sees Mickey Mouse and friends together with tap dancers and line dancers backed by breathtaking singers. There are plenty of other Christmas themed events at the park too for the whole family to enjoy to be sure to check out their website. Which of these theme parks do you want to spend your Christmas at the most? Christmas Tree That Changes Colour With 2 People’s Heartbeats Arriving to Tokyo Midtown! Enjoy your Golden Week holiday to the max with these must-have Disney travel goods! Disney Store and Francfranc to celebrate the live-action Dumbo with new Dumbo-themed goods!